If you’re looking for an affordable way to add some world-class font families to your font library, you’re in for a treat with this new bundle! This collection opens with the extended Baskerville font family – probably the stand-out serif typeface of the past 300 years. Follow this with some of the most popular typefaces of recent years, including award-winning Brother and the stunning modern reimagining Intervogue. With the 99% discount you’ll be making a saving of over $2350, making the price tag for all 333 fonts across 16 font families just $29. This is a limited time offer, so be sure to grab these fonts at this unbeatable price while you can! Each font in The Complete Iconic Font Library has been meticulously crafted by typography masters. You’ll immediately feel the professional quality as you discover the extensive number of styles and weights in each family, with each individual font being fully loaded with OpenType features and multiple language support. There is such depth to this collection that it will continue to give you value for the rest of your design career. This bundle is absolutely packed full with value, and gives you a comprehensive ready-to-use font library for all your future projects. Not only are you getting all these pro-grade typefaces with an unbelievable 99% discount, that $29 price tag also includes web fonts and commercial licensing. 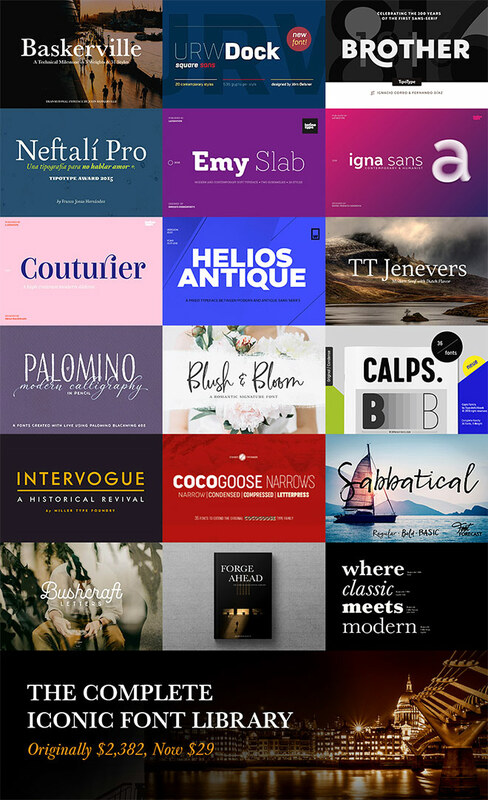 This bundle is ideal for creatives of all kinds, from students who are trying to acquire the tools to get started, to veteran designers who are looking to freshen up their typography.